Corporate eLearning / Inculcating Learning Culture In The Organization - Who’s Baby: Business Honchos or Learning and Development? Inculcating Learning Culture In The Organization - Who’s Baby: Business Honchos or Learning and Development? If businesses are to succeed, questions about organization’s knowledge must be asked in the boardroom. Learning and Development shows must be flocked by key executives, as much as by Learning and Development managers, trainers and gurus. One of my recent discussions with a business leader triggered a debate – Is it the individual employee’s responsibility to develop his or her talent? Or is it the organization’s responsibility to nurture the hidden potential of its employees by providing external training, if necessary, to educate them and develop a culture of learning within the organization. This dilemma made me do some serious reading. “The most successful businesses don’t recruit leaders, they grow their own,” says Morgan McCall, Professor of Management & Organization at the University of South California (In successful business, great leaders nurture talent from the inside By Diane Krieger). The recent promotion of Satya Nadella as Microsoft CEO is strong evidence in support of McCall view. Nadella joined Microsoft in 1992 and, in 20 years, he climbed the corporate ladder to be its CEO.My fellow blogger Sharlyn Lauby@ HR Bartender points out that for an organization, developing its existing talent costs less than hiring – and it is less risky too (Developing Your Talent Costs Less Than Hiring by Sharlyn Lauby). Matthew Bidwell, an assistant professor at Wharton who focuses on patterns of work and employment, also supports this. He says that managers should know that there is a cost to bringing in talent from the outside and that it pays to nurture and promote from within (Why Promoting From Within Usually Beats Hiring From Outside by Susan Adams). Overall, the case for developing internal talent always proves stronger because this carries with itself a priceless element of loyalty.“Talent is not only critical in today’s knowledge economy, it’s scarce. Many executives say finding and retaining talent is a top priority,” says John Hagel, co-chairman, Center for the Edge, Deloitte LLP.In this era – where investment capital, machines and infrastructure are available to all – the only differentiator between profitable businesses and others is the quality of people sitting at the helm and those in the rowing bays. And if we ponder what differentiates one man from the rest of the crowd, it is the quality of thought, the amount of motivation, and the willingness to exceed the limits set by their fellow business leaders. And the only thing which can create this differentiation is the quality of education one receives and the quality of training one gets. Unfortunately, the exponential increase in the rate of development and implementation of new technology, as well as our enhanced business acumen and fierce competition for profit is putting enormous pressure on the sector that provides formal academic education: it is simply unable to meet the requirement of the industry.“A four-year liberal arts education doesn’t prepare kids for work and it never has,” said Alec R. Levenson, a senior research scientist for the Center for Effective Organizations at the University of Southern California (What It Takes to Make New College Graduates Employable by Alina Tugend). What this is leading to is a war for grabbing experienced and capable talent. Even as un-employment soars to new heights in the difficult economic situation, the attrition rate at key positions is high; there is immense pressure on top performers in all organizations.The gurus and subject-matter experts who can train and nurture the new–age workers and leaders are scarce. Even if they are available, not every organization can afford them as well as the infrastructure required for training.Here technology can come to the rescue–with Learning Management Systems and e-learning that can fill the huge knowledge gap between the required skills and the available skill set. LMS and e-learning makes trainings cost-effective, affordable, reachable and repeatable. And who should be at the helm of knowledge initiatives? Simply, anyone who benefits directly from it – including the CEO and the top management; that is, the ones who are responsible for leading the business.Unfortunately, the trend shows that LMS and e-learning are primarily babies of the Learning & Development Manager. When it comes to procurement for and implementation of technology-based learning, all we find across the table are Learning and Development managers struggling hard. 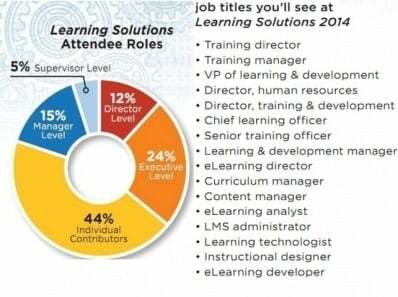 Let’s have a look at the profiles of the professionals attending shows about Learning and Development Technologies –the majority comes from Learning and Development domains. What Can Learning Technology Do For A CEO? An LMS can help the leaders to map the brain of their organization. It can tell how much the employees know about their work and what else is needed to fill the knowledge gaps. LMS, combined with the course can repository of knowledge, can be effectively used for talent development. The learning reports can help CEOs to see how the organization accepts and consumes knowledge, and their personal interest in it can fuel the zeal to learn.If businesses are to succeed, questions about knowledge must be asked in the boardroom. Learning & Development shows must be flocked by key executives, as much as by Learning and Development managers, trainers and gurus. One will not be able to nurture the leaders and the workforce of the future merely by having a good LMS loaded with e-learning courses. The next step is to create a culture of learning – where most members of the organization realize that learning is important for their professional growth as well as the growth of the organization. Their goals should include how much knowledge they gain and upgrade each year.The development of such a culture can happen only when it flows from the top. When the Board questions the CEO about the knowledge initiatives of the organization, the CEO questions the business heads, and so on and so forth.Key managers can dig deep into learning tools to find out how much learning has been consumed, how many people have attended classroom training, and whether everyone attempted the assessments. When questions about knowledge will take the front seat, the organization will be able to leap forward in future.